Much like its northern counterpart, South Dakota has a great job market. The people who live there are happy and get to enjoy the many great amenities that South Dakota has to offer. The state has beautiful scenery. The roads are not filled with traffic. The towns have charm and community, and the residents are friendly. In addition, the cost of living is low. What’s not to love? Visit South Dakota. There are many reasons to relocate to South Dakota. If you find yourself ready to move, let National Dispatch assist you with your auto transport needs. We know how stressful a move can be. There is a long list of to-dos. You have to pack up and vacate your home. You need to get your family into a new home and transport your belongings. Finally, you need to transport your vehicle(s). National Dispatch specializes in providing auto transport services. Below, you will find a few different auto transport options that you may find useful. If you have accepted a job in South Dakota, we would like to congratulate you! Finding a job can be very stressful, and you have done it. Check with your employer to see if they offer a corporate relocation package to cover some or all of your moving expenses. We work with everyone from small business owners to large corporations to help their employees arrive at their new home. We cater our services to meet your specific needs, timeline, and budget. Learn more about shipping a car for a job by reading our Corporate Relocation Guide. Open auto transport is the most popular option that we offer. With this form of auto transport, your vehicle will be loaded up onto a carrier capable of hauling up to nine vehicles. The car carrier is open-air, so your vehicle will still be exposed to weather conditions and road elements. However, open auto transport is a safe, reliable, and fast method of shipment for your vehicle. Read more on open auto transport. Enclosed auto transport is similar to open auto transport. The major difference exists in the type of carrier used. Instead of the car being loaded onto an open-air car carrier, your car will be loaded onto an enclosed car carrier. This protects your car from all road elements and weather conditions. While this method of shipping is offered for all vehicles, we highly recommend using it if you are transporting a luxury, classic, sport, or exotic vehicle. Read more on enclosed auto transport. Where Should You Go In South Dakota? Whichever option you choose, your vehicle will arrive safely! When your vehicle arrives, you may want to explore your new home. Below, you will find a list of places to see and things to do in South Dakota. You have probably read about Mount Rushmore, but if you have never been, you definitely want to put it on your list. It is located in Keystone, South Dakota. At the park you will see George Washington, Thomas Jefferson, Theodore Roosevelt, and Abraham Lincoln carved into the side of the cliff. 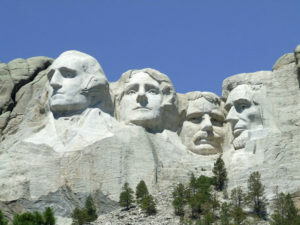 The former presidents were carved, because they are seen as important individuals in America’s history. It is recommended that you stay in the park for at least two hours, so that you can fully take in the monument. In that time frame, you should be able to go to the visitors’ center to watch a short film describing how the presidents were carved into the mountain, walk the Presidential Trail to get up close to the monument, and visit Gutzon Borglum’s studio. Located in Custer, South Dakota, Iron Mountain Road will not disappoint. It is known as being one of the most unusual and captivating roads in the whole country. 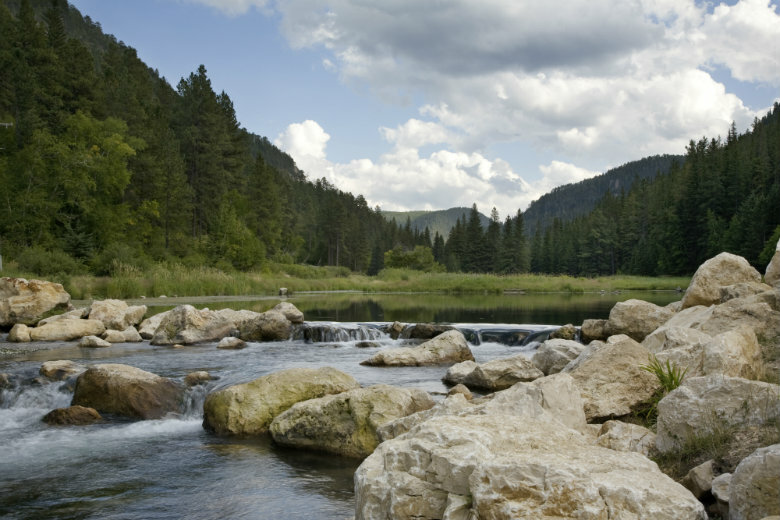 The road itself is a 17-mile stretch through the Black Hills. It is designed with curves to keep drivers at 35 miles per hour, allowing them to take in all of the scenery at a safe pace. This is not just a road with twists and turns. What is so spectacular are the architectural pieces that are on the road. There are beautiful wooden bridges known as pigtail bridges. You will also find one-lane tunnels that were designed to frame Mt. Rushmore National Park. On your drive, you will also see a variety of wildlife, including buffalo, deer, antelope, turkey, sheep, and mountain lions. One way on the road will take you a minimum of 45 minutes, but it is suggested that you drive round-trip to get the most out of your experience. The Reptile Gardens, located in Rapid City, is sure to bring a smile to your face, no matter what age you are. The Reptile Gardens is the largest reptile zoo in the world and a must-see. It is family-owned and operated. On display, you will see snakes, crocodiles, turtles, tortoises, lizards, frogs, a bald eagle, prairie dogs, salamanders, and bugs. Also on display, in the Sky Dome, located just past the entrance, you can experience a warm tropical climate and look at great plant species. The Reptile Gardens includes a variety of activities for its guests to enjoy. One of which is “Pet a Python,” where not only can you pet a python, but you can get your picture taken with one. There are three shows to enjoy during your stay including, the snake show, the gator show, and the bird show. At Rattlesnake Gulch, you can go on a 3D Safari and explore the Wild West. Lastly, you can meditate in Tortuga Falls while you gaze at the turtle and koi pond. This historic site is located in Philip, South Dakota. It tells the story of the Cold War. Between the 1960s and the 1990s, there was a missile field, Minuteman Missile Field, that stretched over the western part of South Dakota. Originally, there were 15 Launch Control Facilities that commanded 150 Launch Facilities that held the missiles. Today, there are two facilities left, Control Facility Delta 01 and Launch Facility Delta 09. These have been preserved by the National Park System. These two sites plus the visitors’ center make up Minuteman Missile National Historic Site. The purpose of the site is to tell the story of the missiles, the nuclear deterrence, and the Cold War. Learn more about Philip, South Dakota. The National Music Museum, located in Vermillion, is a must-see for music-lovers. The museum is in partnership with the University of South Dakota, providing unique learning opportunities for students, including the opportunity to conduct research at the facility. According to the New York Times, the museum is one of the world’s largest and most important collections of historical instruments. The museum holds a musical instrument from nearly all cultures and historical periods. They have everything from violas to fifes. No matter what type of music you are interested in, this museum is sure to excite you. If you are thinking about moving to or visiting South Dakota, contact National Dispatch for auto transport services. Our list of auto transport services are extensive. We cater to your specific needs, timeline, and budget. We offer a free, instant car shipping quote using our quote calculator. No personal information is required. You can also contact us via phone at 800-321-2051.